Last summer, the Vancouver Canucks asked their fans to help design the mask for backup netminder Curtis Sanford. A few months ago, the folks in Minnesota topped that by asking Wild fans to create the mask of starting goaltender Niklas Bakstrom. Now the Manchester Monarchs are getting in on the fun. Yesterday, they announced their own ‘design a mask’ contest for Jeff Zatkoff. They’ve also raised the ante by adding a second component – raffling off the mask at the end of the season. Details of the entire contest are available here. Zatkoff is the heir apparent in Manchester after backing up AHL Goaltender of the Year, Jonathan Bernier, last season. 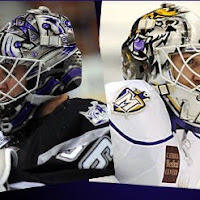 As the Monarchs second netminder, he compiled a 10-9-3 record in 22 games, after playing for the ECHL’s Ontario Reign the year prior. He also is among the large group of college players in the Kings system, having been drafted out of Miami (OH) University in 2006. That THN article also addresses the fact that Bernier continues to get all the hype as the ‘next big thing’ for Los Angeles…a growing storm that will possibly reach full flurry early this coming season, when he battles Johnathan Quick for the Kings staring position. For Bernier’s mask this year, I suggest he goes with an old school circus theme. The design could feature him and Quick engaged in various feats of strength – arm wrestling, tug of war, etc. Frank Costanza could even be included as the referee. It’s a classic in the making!